On May 30, The Age Well Community Council of Danbury, formerly the Aging In Place Council of Danbury, sponsored a “reveal and recognition” event to celebrate the launch of their newest initiative – Age Well CT, the official, easy-to-use website for resources, news and events for older adults in Western Connecticut. The new site allows residents region-wide access to trustworthy information about healthy aging programs, events and resources all in one place, and is entirely supported by local philanthropic foundations, municipalities and volunteer experts. Participating communities to date include Brookfield, Danbury, Newtown, New Milford, New Fairfield and Woodbury. 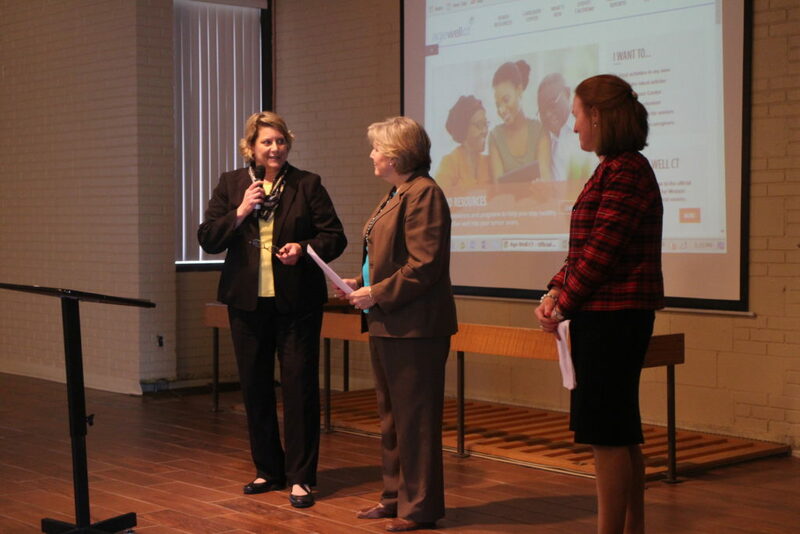 The new site, http://agewellct.org/, was demonstrated to community leaders and residents during the press conference, while others will experience the site for the first time during a series of “launch and learns” where participants will be introduced to site features including region-wide resources, and a dedicated Caregiver Support Center. “Our new Age Well CT website further proves the Council’s commitment to building and supporting communities that are full of vitality, where young and old thrive. We firmly believe that strong communities are great places to grow up and great places to grow old,” said the Honorable Dianne Yamin, Judge, Danbury Probate Court and Co-Chair, Age Well Community Council. Nationally, 87 percent of adults aged 65 and older want to stay in their current home and community as they age. Among people age 50 to 64, 71 percent of people want to age in place. The Age Well Community Council of Danbury is a unique collaboration comprised of representatives from government, business, philanthropy, faith, nonprofit and other community organizations, and it carries the ultimate goal of preparing for the aging demographics by enhancing the availability and accessibility of region’s community features, such as health and social services, community engagement and infrastructure. In doing so, quality of life for older adults will improve and the ability of people as they age to live safely, independently and with dignity in the home of their choice can be realized. The Council prohibits advertising and provider sponsorship on the Age Well CT website to maintain its trusted and independent status.